Autoimmune hemolytic anemia (AIHA) is an immunological disease resulting from erythrocyte hemolysis caused by circulating autoantibodies against antigens on erythrocyte membrane, which can cause erythrocyte lysis, leading to an insufficient number of oxygen-carrying erythrocytes in the circulation. The lifetime of the erythrocytes is reduced from 100 to 120 days to just a few days in serious cases. The causes of AIHA are poorly understood. The disease may be primary or secondary to another underlying illness. A new report shows that the annual incidence rate of AIHA is 0.8–3.0/l000, and the death rate is 11%. The classification rates of warm reactive autoantibodies in clinic were anti-IgG type 37.7%, followed by anti-(IgG + C3d) type 52.5% and the anti-C3d type 8.2%. These autoantibodies are present on erythrocyte membrane and also in plasma. In AIHA, direct antiglobulin test (DAT) positive rates of up to 96%–98% due to autoantibodies or immune complex adhesion on erythrocyte membrane receptor induced by CR1, which often cause difficulties to identify ABO and Rh group and crossmatch., Other studies suggest that using in-vitro hemolysis tests are useful in finding the best erythrocyte donor,, but it could be a waste of time. Elution of autoantibodies from sensitized erythrocytes is difficult. In this study, we took two common elution methods, cysteine-activated papain and dithiothreitol (ZZAP) and chloroquine phosphate (CP), to elute warm autoantibodies from sensitized erythrocytes and to absorb autoantibody in plasma with eluted erythrocytes. A total of 20 cases of AIHA with DAT positive caused by anti-IgG type autoantibodies were randomly selected; another 20 samples with DAT positive caused by anti-(IgG + C3d) were also randomly selected. A total of 40 samples with crossmatch difficulty were collected from the hospital. DAT was performed using micro-column gel method containing monoclonal anti-IgG and monoclonal anti-C3d, respectively. Erythrocyte suspension was added into the micro-column after washing, and the results were observed after centrifugation. Mix 0.5 ml, 1% cysteine-activated papain solution, 2.5 ml, 0.2M dithiothreitol, 2 ml, PH 6.5 PBS, and calibrate to get a pH of 6.0–6.5. Take one tube, add 1 ml packed erythrocytes and 2 ml ZZAP reagent, mix well from time to time, and incubate at 37°C for 30 min. Then, wash erythrocytes three times with 0.9% normal saline. Take one tube and add 1 ml packed erythrocytes as above and add 1 ml plasma of AIHA patients, mix and incubate at 37°C for 30 min then centrifuge to collect absorbed serum. After absorption of all antibody erythrocyte components of donors were cross-matched with absorbed patient's serum using micro-column gel method. Take one tube, add 0.2 ml packed erythrocytes and 0.8 ml, 200 ml/L CP solution, mixing the tube from time to time and incubate at 37°C for 30 min. Then, wash erythrocytes three times with 0.9% normal saline. Then, a small amount of packed erythrocytes was used for DAT. The main cross match with micro-column gel method was performed. DAT agglutination intensity of the original samples minus agglutination intensity of eluted erythrocyte after using two elution methods was calculated. Erythrocyte agglutination intensity after cross-match test was also calculated. The higher the scores, the better were the processing in case. In case of crossmatch test, a lower score indicates better antibody absorption. The SAS8.1 statistical software was used for statistical analysis, rank count data using the Kruskal–Wallis test, P < 0.05 and 0.01 had statistical significance. The effect of using ZZAP to elute anti-IgG sensitized erythrocyte was better (score of 82 vs. 56) than that for anti-(IgG + C3d) (P < 0.05). ZZAP elution technique for anti-IgG type sensitized erythrocytes was better than that for CP technique (score of 82 vs. 52) (P < 0.05). 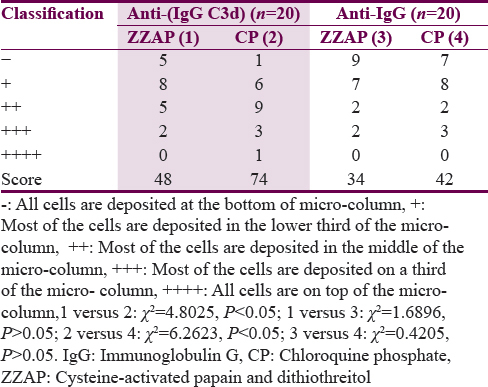 The difference on anti-(IgG + C3d) type sensitized erythrocytes by ZZAP and CP elution was not appreciable (P > 0.05) [Table 1]. The effect of absorption using ZZAP to elute anti-(IgG + C3d) sensitized erythrocytes is better (score of 48 vs. 74) than with CP (P < 0.05). The effect of absorption using CP to elute anti-IgG sensitized erythrocytes was better (score of 42 vs. 74) than the anti-(IgG + C3d) (P < 0.05). No significant absorption effect was observed using ZZAP and CP to elute anti-IgG sensitized erythrocytes (P > 0.05). Further, there was also no significant absorption effect using ZZAP to elute anti-IgG type and anti-(IgG + C3d) sensitized erythrocytes (P > 0.05) [Table 2]. AIHA is caused by warm autoantibodies. Only 2%~4% of AIHA patients had exclusively warm autoantibodies, but DAT test was negative. AIHA is classified as either warm AIHA or cold AIHA. AIHA involving IgG is generally characterized by phagocytosis of erythrocytes. IgM is a potent activator of the classical complement pathway; thus, AIHA involving IgM is characterized by complement-mediated lysis of erythrocytes. IgM also leads to phagocytosis of erythrocytes, however, because phagocytic cells have receptors for the bound complement (rather than FcRs as in IgG AIHA). Complement fragments, such as C3a, C4a and C5a, activate granular leukocytes (e.g., neutrophils), while other components of the system (C6, C7, C8, and C9) can form the membrane attack complex or can bind the antibody, aiding phagocytosis by macrophages (C3b). Positive DAT always exists in association with AIHA and form basis for its serologic diagnosis. The cause of DAT positive autoantibody may be anti-(IgG + C3d), anti-IgG or anti-C3d) sensitized erythrocytes. These are often considered to be nonspecific antibodies. Some of the autoantibodies have specificity toward specific blood group antigens. The presence of autoantibodies can mask the existence of the alloantibody, causing a severe blood transfusion reaction. Transfusion is widely used in clinical practice and is an important part of modern medicine. Although many cross-match methods are reported and used in clinic, there are few effective methods for AIHA patients with DAT positive. Detection of autoantibodies present in plasma and their removal followed by a complete crossmatch can be challenging. This study compared two elution methods ZZAP and CP, which selectively elutes the antibody without destroying the erythrocytes. IgG molecules combined with erythrocyte membrane may lose their integrity after elution by ZZAP methods. Glycoprotein or lipoprotein of antigens on erythrocyte membrane may be destroyed after elution test and may increase absorptive capacity of eluted erythrocyte to combine with autoantibody in plasma. Studies have reported that ZZAP elution can destroy some blood group system antigens, such as K, M, N, Fya, Fya, S, and s. CP elution is the most widely used, which can maintain the integrity and antigenic activity of erythrocyte membrane. However, CP elution of erythrocytes will increase erythrocyte hemolysis, accelerate erythrocyte aging and lead to, loss of part of cell membrane, antigens such as M, Jka, and Jkb Do antigens.,, Furthermore, CP elution is reported to cause Bg antigen shedding from erythrocytes. 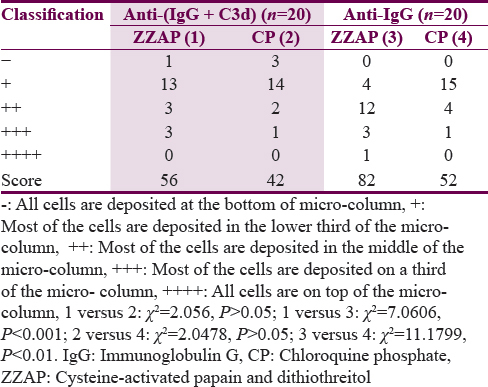 The results showed ZZAP and CP elution cannot elute autoantibodies when they are bound by anti-(IgG + C3d), but for anti-IgG type autoantibodies, the effect of elution with ZZAP was better than CP elution. For absorption of anti-IgG type autoantibodies in plasma, there was no significant difference using ZZAP and CP eluted erythrocyte. The absorption effect of processing by CP elution on anti-IgG type autoantibodies is better than on anti-(IgG + C3d) type. ZZAP elution for anti-IgG type and anti-(IgG + C3d) type autoantibody sensitized erythrocytes showed no difference. In our view, using two elution methods for elution of anti-(IgG + C3d) type autoantibodies is essential. For anti-(IgG + C3d) autoantibodies, we recommended no elution and absorption but just selection of donor erythrocytes components with the weakest agglutination intensity of antigen and autoantibody reaction and recommended to transfuse washed erythrocytes component; studies have reported, that patients with autoantibodies can be transfused “the least incompatible” erythrocytes component, without any evidence of clinical symptoms of severe acute or delayed hemolysis. For anti-IgG type autoantibody-positive patients, to detect coexisting alloantibodies, we need to use ZZAP or CP elution to elute sensitized erythrocytes and to absorb anti-IgG autoantibody in plasma and further to identify alloantibody specificity. If the patient needs transfusion, the corresponding antigen negative erythrocytes components can only be used. This study was approved by the Ethics Committee of the Blood Center and all aspects of the study complied with the Declaration of Helsinki. Dierickx D, Kentos A, Delannoy A. The role of rituximab in adults with warm antibody autoimmune hemolytic anemia. Blood 2015;125:3223-9. Ling H. Autoimmune hemolytic anemia, immune phenotype and clinical significance. Lab Med Clin 2014;11:1478-9. Lan JC. Blood mathcing test in patients with autoimmune hemolytic anemia. Chin J Blood Transfus 2015;28:753-4. Zheng QZ, Chen YW, Deng CF, et al. Blood matching method of 26 AIHA patients. Chin J Blood Transfus 2010;23:217-8. Yuan M, Tang CH, Wu AY, Yang HC, Gan WW, Zhang TW, et al. Blood matching and transfusion for 12 acute autoimmune hemolytic anemia patients by extracorporal hemolysis test. J Exp Hematol 2014;22:1716-20. Fang D, Ni D, Wu LJ. Comparison on the efficacy of two kinds of blood matching method for autoimmune hemolytic anemia. J Mod Lab Med 2016;31:130-3. Gehrs BC, Friedberg RC. Autoimmune hemolytic anemia. Am J Hematol 2002;69:258-71. Branch DR, Shulman IA, Sy Siok Hian AL, Petz LD. Two distinct categories of warm autoantibody reactivity with age-fractionated red cells. Blood 1984;63:177-80. Segel GB, Lichtman MA. Direct antiglobulin (“Coombs”) test-negative autoimmune hemolytic anemia: A review. Blood Cells Mol Dis 2014;52:152-60. Zhou ZZ, Xu D, Sun L, et al. The progress in pre-transfusion test technique research. Asia Pac J Blood Types Genes 2017;1:7-12. Naleway AL, Belongia EA, Donahue JG, Kieke BA, Glanz JM; Vaccine Safety Datalink, et al. Risk of immune hemolytic anemia in children following immunization. Vaccine 2009;27:7394-7. Edwards JM, Moulds JJ, Judd WJ. Chloroquine dissociation of antigen-antibody complexes. A new technique for typing red blood cells with a positive direct antiglobulin test. Transfusion 1982;22:59-61. McShane K, Cornwall S. Chloroquine reduces antigen strength. Transfusion 1985;25:83. Chen J, Spruell P, Moulds M. Studies using Chloroquine Diphosphate to Strip HLA A and B Antigen from Red Blood Cells (RBCs). New Orleans: ISBT/AABB Joint Congress; 1990. p. 152. Beaumont AE, Stamps R, Booker DJ, Sokol RJ. An improved method for removal of red cell-bound immunoglobulin using chloroquine solution. Immunohematology 1994;10:22-4. Tyler VV. Technical Manual. 12th ed. U.S.A: Association of Blood, Bank; 1996. p. 442-3. Das SS, Zaman RU, Safi M. Incompatible blood transfusion: Challenging yet lifesaving in the management of acute severe autoimmune hemolytic anemia. Asian J Transfus Sci 2014;8:105-8. Wensheng Y, Feng YI, Ruihong HE, et al. Autoantibodies with mimicking specitidty detected in patients with autoimmune hemolytic anemia and the influence on blood transfusion. Exp Lab Med 2015;33:403-7.